do you have a tap n go? what is your view on this subject? I prefer cash. Call me paranoid, but I prefer not to have my casual shopping tracked by some data mining corporation. (They probably still can track what was bought, but not who bought it.) It's also a simple and efficient countermeasure to the problem you described. The average thief can't steal more cash than what you are carrying with you. I've always seen that sort of tech as dangerous for more or less the reasons you mention. Plus I don't really subscribe to the idea of convenience, I can understand wanting to buy some shirts or anything else of actual value within the limit but I seriously question the motives behind a person buying a bag of chips or a single drink and not being able to gather the cash for it. Working in retail you do see people use it more often of course but I distinctly remember a person using a credit card to buy a Chupa Chup. (probably wrong spelling) Seriously? You don't have 35 cents to pay for a lolly? I'm also one of the rare few that refuses to get a credit card or pay over the internet because of the inherent lack of control or security. I'm smart enough to know that credit cards work largely by people using it too much and then not paying for their impulsiveness, and that for all the security there is on the net it is never entirely secure due to hackers constantly updating their attacks. But that's just me, maybe I'm just too paranoid. The risk of a thief just bumping into you with a a portable nfc reader on a tram or street and skimming your card is something I can't get over. If I ever have to carry one of these I'll be placing it in one of those signal-killing sleeves, which completely defeats the convenience argument. Eshhh, so much in agreement with this. 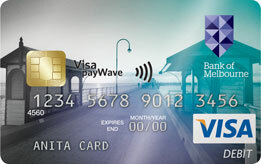 I have a card with the new "EMV chip" systems, but thankfully no wireless. The actual floor limit is set for each merchant based on the card issuer's risk assessment and other factors. US$25 is the lowest value found, but US$50 is also very common. For lower risk merchants, or those willing to pay a higher "discount rate", a floor limit of US$100 (as found at Costco), or even more, may be assigned. The actual floor limit is set for each merchant based on the card issuer's risk assessment and other factors. You're right. Plus you can't hack cash. The athletic greens isn't just for athletes ya know. I am a member of the Westpac Banking Group slash Bank of Melbourne so for me this is great news!